Vander Blue is looking to improve in a few areas before the NBA draft to prove he’s worthy of a draft selection. But more important, he’ll be competing against other shooting guards who have the same goal in mind. Blue has stated that he’d like to transition to point guard at the next level–and we’ll have PG rankings later–but NBA general managers may see Blue at his natural position, so that’s what we’re breaking down today. Over the last 10 seasons, 123 shooting guards have been drafted, with as many as 15 being taken in 2006 and 2012, and as few as 10 taken in 2010 and 2011. Some of these players have had point-guard capabilities, so we included those, but did not include pure point guards in the total. Every draft is different, so there isn’t too much stock to be taken from previous results. But for the sake of analyzing and arguing, we can safely assume Blue must rank in the top-15 to have a shot at being drafted–no, Blue doesn’t need to be selected in the draft to make it in the NBA, something Wesley Matthews proved, but it’s still every player’s goal. Here are the top 25 shooting guards in this year’s class–our rankings, so debate as you will–and where Blue stands among them. Of the groups, we ranked each in terms of how good a chance Blue has of moving up before draft night. No chance: With these players it’s time to be honest: Blue has a zero percent chance of being selected higher. He could dazzle at the NBA Combine, dominate in individual workouts and come off as a star during interviews, but the players below will be selected before him. Period. 1. Ben McLemore, 6-foot-5, Kansas: The ultra-athletic shooter has stellar range, can rebound and has perhaps the best chance of anyone in this class to become a true superstar. 2. Victor Oladipo, 6-foot-5, Indiana: The best perimeter defender in the class has improved his outside shot and can get to the hoop at will, and he has the leadership skills teams in the lottery are looking for. 3. C.J. McCollum, 6-foot-3, Lehigh: One of the most accomplished player in the draft, this senior has a quick first step and excels in transition, combined with solid defensive traits. 4. Shabazz Muhammad, 6-foot-6, UCLA: The top 2012 high school recruit has plenty of upside and can score in a variety of ways, but struggles defensively and isn’t terribly athletic. 5. Kentavious Caldwell-Pope, 6-foot-5, Georgia: Playing for the Bulldogs didn’t give him much national notoriety, but he’s a deadly outside shooter and has excellent size to help on the defensive end. Little chance: Never say never with these players, but Blue is still below these fringe Lottery-to-first-round picks and it would take some serious improvement on his end, combined with each players’ stock falling for Blue to move ahead of these players. At this point it would be nothing short of a small miracle for Blue to move into the top-six. 6. Allen Crabbe, 6-foot-6, California: One of the better scorers and shooters in the class, Crabbe likely will move to shooting guard at the next level, as he’s undersized as a small forward. 7. Jamaal Franklin, 6-foot-5, San Diego State: Franklin has excellent size and length for the position, gets to the basket and is a superb rebounder, but hits jump shot could be a concern for teams. 8. Archie Goodwin, 6-foot-5, Kentucky: Having played for John Calipari, Goodwin is automatically a serious prospect. However, he needs refinement in his game and much improve from the perimeter. 9. Ricky Ledo, 6-foot-6, Providence: Much like Lance Stephenson, off-the-court concerns and a lack of effort are sure to make teams nervous, but like Stephenson, his strength and ability to play the point make him intriguing. 10. Alex Abrines, 6-foot-5, Spain: As is the case with all international prospects, rankings and scouting reports come from draft databases. Abrines is a fantastic outside shooter and athlete, but needs to add strength before seeing playing time at the next level. 11. Reggie Bullock, 6-foot-6, North Carolina: The underrated scorer took a major step in his junior season, and his versatility will serve him well at the next level. He could probably ranked higher on this list. 50-50 chance: None of the below players are guaranteed first rounders but, for one reason or another, still have a leg up on Blue. Keep an eye on these players to compare Blue to during NBA Combine and individual workouts. 12. Glen Rice Jr., 6-foot-6, Georgia Tech: One of the hardest-working defenders in the class, Rice Jr. will need to prove his offensive worth to be considered in the first round. He did, however, average 25 points per game in the D-League last season (was kicked off GT’s team). 13. Tony Snell, 6-foot-7, New Mexico: A natural small forward, Snell’s lanky frame may push him to shooting guard, a position where his outside shot and athleticism could make him a first-round pick. 14. Tim Hardaway Jr., 6-foot-6, Michigan: One of the stars of the NCAA Tournament, Hardaway Jr. does just about everything well, but nothing great. He could be a solid value pick based on family genes and upside. 15. B.J. Young, 6-foot-3, Arkansas: This combo guard played primarily at the point, but his ability to score and explosive first step make him a viable candidate to see plenty of time at shooting guard. The main competition: Now that we’re out of the (extremely) unofficial cut-off, these are players who we can safely assume are right in the thick of it with Blue (he’s in this group). These players are looking to move into the top-15 and are–for the most part–players who had great collegiate careers but may not stack up against the better prospects. They’ll have to prove their work over the next 40-or-so days. 16. Sergey Karasev, 6-foot-7, Russia: Per ESPN.com’s Chad Ford, Karasev can play multiple positions, has stellar floor vision and can get to the basket. His upside is a toss-up, but he’ll be able to contribute from Day 1. 17. Vander Blue, 6-foot-4, Marquette: The Golden Eagles’ leading scorer made a giant leap in his junior season and has the length to defend, but his outside shoot needs serious improvement, despite the improvement. 18. Brandon Paul, 6-foot-4, Illinois: He can score from anywhere on the court but inconsistency and effort are concerns. If he shoots well in pre-draft camps, he has a solid chance at being drafted. 19. Michael Snaer, 6-foot-5, Florida State: Always a flair for the dramatic, Snear did most of his damage around the basket and on the defensive end, though he’s still an impressive shooter. 20. Seth Curry, 6-foot-3, Duke: If his brother, Stephen, has proved anything, it’s that a Curry with an outside shot is a good bet to succeed. Seth isn’t much of a point guard like Steph has loosely become, but the upside is there. 21. Durand Scott, 6-foot-3, Miami: An outstanding defender, Scott can play both guard positions, but where he fits in at the next level is a major question. He did run plenty of pick-and-roll action with the Hurricanes, which will help. Also looking to move up: Blue should be widely considered ahead of these players on most, if not all, big boards. They have potential to move up, like all prospects, but Blue’s traits give him the upper hand to date. 22. Kenny Boynton, 6-foot-1, Florida: Nate Robinson’s playoff performance has done wonders for undersized scorers, and Boynton fits that bill quite well. 23. Khalif Wyatt, 6-foot-3, Temple: He almost became NCAA Tournament Hero No. 1 against Indiana, and the toughness seen in that game is sure to be ingrained in the minds of NBA teams come draft time. 24. Will Clyburn, 6-foot-6, Iowa State: A lot like Jimmy Butler in a lot of ways, where he can play both shooting guard and small forward and is a great rebounder. If his jump shoot improves, his stock will, too. 25. Carrick Felix, 6-foot-6, Arizona State: His size allows him versatility on the defensive end and he’s much better around the rim than he is from the perimeter. He’ll be 23 years old when the NBA season begins. I was pretty shocked that Blue went for the draft. I understand striking while the iron is hot but I never thought of him as an NBA player. I think he can make a living playing basketball but it will be across the pond. I don’t see him getting drafted. Best of luck and I hope he can surprise a lot of us. 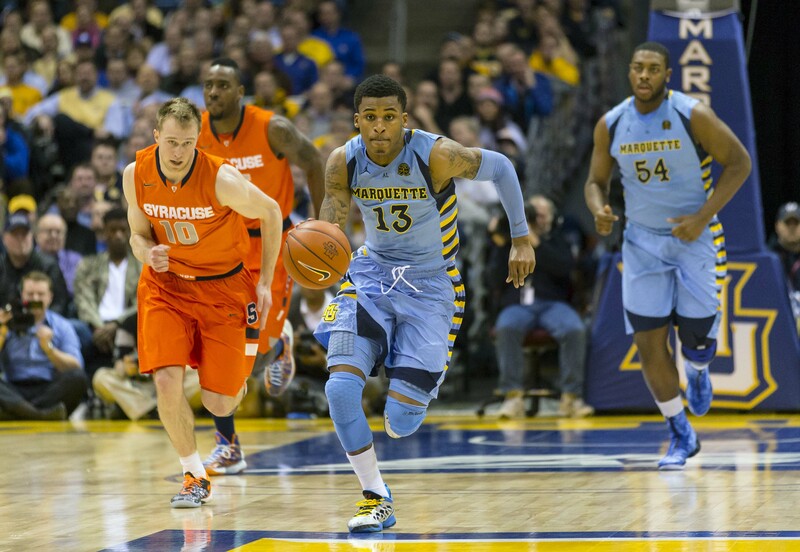 Marquette is returning a good team and it could be a special year.